PROVIDENCE -- It could be so easy to be Neil Young: Stroll out, take a bow, a little 'Southern Man' here, a little 'Ohio' there, 'Cinnamon Girl,' 'Like a Hurricane,' 'Heart of Gold,' 'Rockin' In the Free World,' thank you, good night. But with that kind of nostalgia trip, Young wouldn't still be packing the Providence Performing Arts Center at age 65 like he did on Friday night. His latest record, 'Le Noise,' was a revved-up, raucous piece of work (even though it was a solo disc) and while Young busted out a few of his best-known songs -- including some of the ones listed above -- he took plenty from the new disc and a few unreleased songs even newer than that. Prowling a stage filled with instruments like a professor in mid-lecture, Young went from truly acoustic guitar to heavily amplified acoustic guitar to electric guitar to piano to organ in the course of the show. The set list was basically the same as most shows on his current tour, and Young started with 'My My Hey Hey (Out of the Blue),' his baleful voice and harmonica complementing each other strongly, the sweet and soothing 'Tell Me Why' and a 'Helpless' that re-created the stillness the lyrics describe. 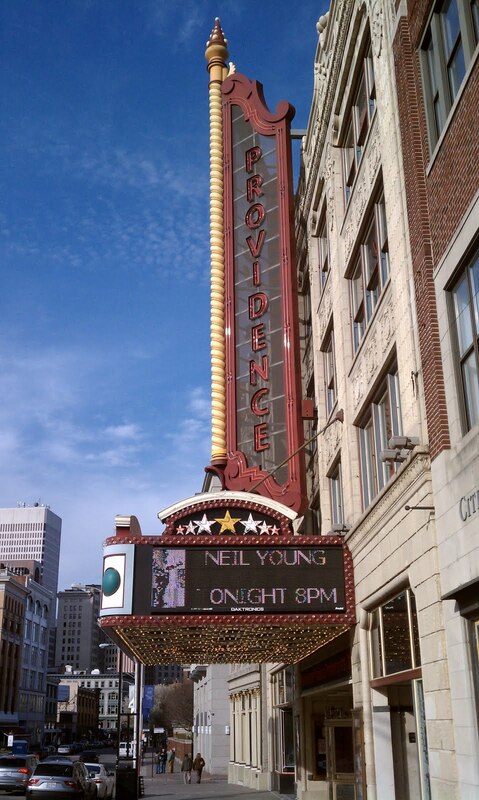 Neil Young will be performing tonight at Providence Performing Arts Center, Providence, Rhode Island. Special guest Bert Jansch will open concert. I give up on concerts when they cost a small fortune. Just got home frm PPAC, great show. Third time I've seen this show, all three different. PPAC is a great venue in a vibrant area of downtown Providence. Nothing but friendly people everywhere I went. I took my son out for a meal at a place called Cuban Revolution before the show. Just a short walk to the show after dinner. Bert was good, although a little hard to understand the words to his song. Neil didn't have much of anything to say, he just let his music speak for itself. No change in the setlist, but I knew that going in. Very happy to have seen this show, and the people who work as ushers at the PPAC were first rate. Neil's voice was as good as I have ever heard it. My 30 year old son was completely blown away by the show, and I was glad to have his company. A good night in an otherwise forgetable year in my life. Thanks Neil. Nobody cares if you could have gone and didn't want to pay the money. Apparently you do care, seeing how you responded to my post, Mr Anonymous. Still love Neil, but he's on a money grab to make back $$$'s that he no longer gets from record sales. So, if it was too expensive, why did you buy tickets and attend the show yet provide no details as to why the concert wasn't worth it? Looks like it's time to revisit How To Spot A Bogus Concert Review in 3 Easy Steps. Also, see For The Turnstiles Yet Again. Last night's show in Providence was fantastic. Neil Young, and the great Bert Jansch, deserve every penny of the ticket price. Great review in this morning's Providence Journal. I am going to go see Mr. NEIL YOUNG in Chicago and can't wait!! Neil, You Played Cortez. I did yell out this request. And was obliged. You were breathtaking! THANK YOU!! In my opinion the audience did not reflect what you delivered.. I loved the stage setting and lighting and YOU. To those who feel otherwise- their loss. It was a Friday night. I was at the PPAC. I had a comfortable seat in the front row. I witnessed incredible performances by two masters. I am not worthy ! Party on Bert. Party on Neil. Long may you run ! Come back soon ! Seeing Neil Young play live is always an extraordinary couple hours- always. To have a true music and cultural legend be in the room, doing what he does best- performing his art for you. A Neil show is always an event, a real musical experience- never have I gotten the feeling- after 17 shows that it was simply being "phoned in". Knowing the setlist ahead of time, I figured I knew what to expect going in- but I was completely wrong! The songs are just the canvas to which Neil lays down the true creation that evening- the performance. I think we may, as an audience, get too hung up on songs in a strict sense. We want to hear this song or that song, while missing the overall feel and vibe of the evening. I believe the key to the whole Twisted Road/Le Noise trip may be the nuance- the subtleties going on constantly. The lights on the four panels behind Neil changing colors at specific songs or specific lyrics- such as red when Neil sings "what a Killlerr" on Cortez or the "Earth Colors" changing and becoming distorted on Rumbling, the album itself with its small sonic touches of color, also the setlist, the stage setup and the choosing of instruments, etc. I believe many things are completely intentional and thought out as has sort of been Neil's trip going back to Tonight's the Night and Rust Never Sleeps. Small touches, that may have little or a lot of meaning, that when taken all together make for huge artistic expression and experience. Having seen the Twisted Road on its first leg, about four or five shows in (Wallingford CT) I must say that tonight's show was much more Rockin' and in your face compared to the first, which in comparison seemed much more dark, and slightly mysterious- spooky, which was why I originally liked it to the closest thing to Tonight's the Night. In Wallingford that night, Neil seemed to be exorcising some real demons. 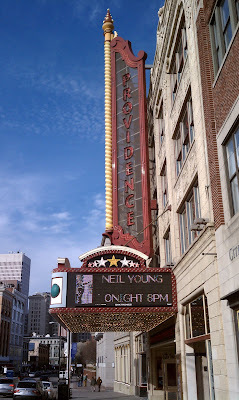 In Providence, Neil seemed much more confident in this material and delivered it well. The album has been released, the songs were now aged a bit and road tested with, again, subtle changes throughout. Neil enters the stage very nonchalantly, without the entrance songs or darkened lights, etc. just steps out- which I love. The audience gave him the welcome he deserves- an eruption of a roaring ovation that went on for a few minutes. Neil sits and strums the opening riff of Hey Hey, My My- the riff that first turned my head around and caught my ears when I put on RNS just by chance because I liked the cover, thus beginning my long road of being a Neil fan. Tonight's rendition was excellent and moving. Tell Me Why and Helpless were both very well done. As a huge fan I was looking forward to the Le Noise material slightly more than the hits and of course Neil doesn't disappoint. You Never Call, this time around seemed much starker and more moving than the first time- (this time he included all the lyrics). The Hitchhiker was PHENOMINAL- he shook that ornate little theater! I love that bass petal he uses- he steps on that thing and the bass literally blasts you in the face and shakes your seat- very disorienting, but in a good way. When Neil just stops cold for one second after "we had a kid and we split apart" it's breathtaking. Other highlights were Ohio, Down by the River- on which Neil jammed just slightly more between verses this time out. Leia, I found really poignant perhaps because I have a 15 month old daughter, were that not the case I think I'd still like it as the sort of little ditty that Neil has done throughout his career (Till the Morning Comes, Cripple Creek Ferry). Also an excellent Sign of Love and I Believe in You (a little less echo or reverb on his voice this time out I think). Cinnamon Girl was great, but that's the one song he does I feel doesn't work well solo electric- it just needs that stomp! But then he came back Walk with Me and he hit it right out of the park- more feedback, more passion this time- the meaning, it seemed was not lost on this audience. He left the stage ringing and it was over too quickly. My only complaint is that the seats in the theater were TIGHT! Possibly worse than MSG? Really packed in and it got hot in there. Also the greatest hits crowd are somewhat annoying- but that's the fanatic in me I suppose. Someone was yelling out some really obscure tunes like "Pressure"- which was funny. I bought a beautiful show program filled with excellent photos and drawings done by Eric Johnson. Bert Jansch was awesome! What a player! Just be quiet and listen- you'll be amazed at this huge talent! If you are seeing a show on this tour, go with an open mind and pay attention! I'm really glad Neil decided to go out on the Twisted Road again and look forward to the next thing- whatever it may be.